Get ready to step into a whole new world. The Oculus Rift's next-generation virtual reality experience completely immerses you in fantastic game worlds, intensely emotional movies, and much more. A pair of included Oculus Sensor X2 Touch Controllers put incredible virtual worlds at your fingertips. With a metallic shriek your fighter zooms through the launch tunnel and soars into the inky blackness of space. You tilt your head and quickly take stock of the situation: enormous carrier ships drift slowly below and on your right -- are those enemy fighters? Lasers rake across your shields and you jam the stick hard, veering away from enemy fire. You line up a fighter in your sights and your autocannons chatter as tracers streak through the void, turning the enemy into a blossoming fireball. When the battle is over you take off the Oculus Rift headset and give yourself a few seconds to get reacquainted with reality. It almost feels strange to look around and see the familiar confines of your living room instead of the tight, futuristic structure of the fighter's cockpit. Playing the virtual reality space combat game felt so real you almost forgot you were sitting in a chair at home. In fact, it felt so immersive you can't wait to jump back in. With a grin you slip the Rift headset on and leap back into the heat of battle. PC required: The Oculus Rift requires a PC with certain minimum specs. Please see the "Required hardware" section below. Incredible visuals: 2160 x 1200 resolution (1080 x 1200 per eye), a 110-degree field of view, and 90Hz refresh rate combine to create an immersive visual experience you need to see to believe. Integrated VR audio: The Rift's audio system places sounds in three-dimensional space, so it actually feels like sounds are coming from the side or above you. Removable audio arms: Enjoy the freedom to use your own headphones, if you prefer. Oculus Home: Explore a wide (and ever-growing) selection of games, movies, and experiences. Endless worlds await. Controllers: The Rift includes a pair of Oculus Sensor X2 Touch Controllers, which bring your hands into the virtual environment for a more tactile, realistic VR experience. Ordered the Oculus rift set online and found out 3 weeks past the delivery date that the package was lost. Bestbuy had me contact Canada Post to see what the issue was and they informed me that the package was never sent by Bestbuy as it was never initially scanned in. 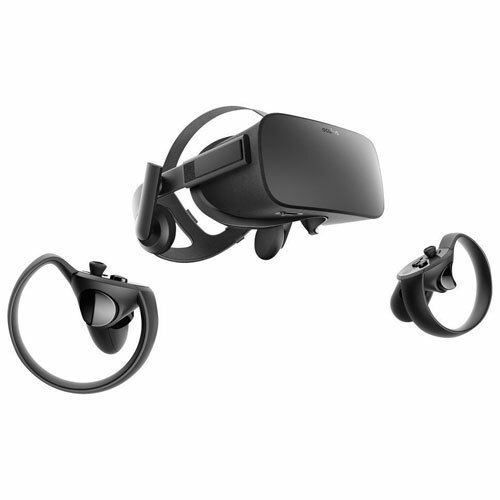 I could not get another Oculus set to replace the one lost as it is now sold out online and in store. My funds were refunded as expected so they got 1 star, but the customer support was not good. Still no VR. I absolutely love the Rift! I loved VR since purchasing the PS4 VR system when it came out and the Rift improves on everything. Couldn't be happier with this purchase. Better movement tracking, lighter & more comfortable, awesome touch controllers and works in all light conditions. The setup was simple and the Oculus app has all you need to tweak and make the system your own. Within 20 minutes I was up and running...literally! If you have a computer with specs to run the Rift...what are you waiting for?!? Now on my third computer (Acer Nitro 5) because they keep updating the software and excluding the older models. So from bestbuy I bought a brand new Acer Nitro 5 based on the Oculus.com website recommendations, took it home, ran the compatibility check and everything says its okay, so decide to keep it and put it under the tree. Give the computer to my kid xmas morning, and it doesn't work. Have to email tech support (no more phone, no more chat) and they tell me two days later that my laptop is one of the 6 acer nitro 5 models they dont support. Only two out of 8 they actually support. No where on their website or best buys website do they actually say that there are specific Nitro 5 builds that will only work with the oculus. Responded with my answers to their other questions and 4 days later, still no response form Oculus support. Save yourselves the money. I'm now returning the Acer Nitro 5, hopefully selling the oculus to some chump, and switching to the Vive. At the very least they have chat support. They charge extra on their store for people using American Express to buy apps and games. I cannot recommend any of their products on this basis. I highly recommend worth every cent and if u buy an oculus then i'd say that a game called Beat Saber is a must have. Virtual Reality is now Reality. Oculus is arguably the best headset overall even at the time of writing this review, despite the fact that there are a couple of newer headsets out there with slightly higher resolution. 360 room-scale tracking works flawlessly. (You may need to buy a 3rd sensor for optimal results) The stock headphones are impressive and offer serious 3D sound. It sits comfortably with tons of adjustment options. Even after almost a year of owning it, 2D games can't keep my interest for very long because of how incredibly amazing and immersive the Rift is. I have an excellent gaming monitor and sometimes feel buyer's remorse for it because it mostly serves as a basic monitor for emails and surfing. And the touch controls? THE best by far - period. I puchased this directly from oculus. It was on sale and came with 2 sensors and 2 controllers. I mainly fly combat simulator and have used track ir in the past. The feeling of being in the aircraft is amazing. You can look arround like you where there. 3d in theatre doesnt even compare. Judging that something is a few inches away, several feet or hundreds of feet away makes this experience amazing as everything looks and feels true scale! If your pc meets the specs GO and get one! Bought this while it was on sale around Black Friday and used the savings to buy another 2 sensors. Then bought the better headphones and a vr cover and wow. Full room scale, comfortable, sounds great, looks great (can't wait until higher resolution sets are here). Setting up 4 sensors on the wall with the cables needed for the headset was a lot, and was confusing but it is well worth it, and there are many videos that can help show u da wae. Bought this for my husband for Christmas - it is amazing and he is so delighted with it. We have tried many of the free aps which are truly and experience, he has already purchased a game or two and is loving it! I'm gonna be honest, I walked into this completely blind. I have never experienced any VR up to this point. From the moment I put the headset on, mind completely blown. You really have to experience it to appreciate it. As an avid gamer, this has changed my whole outlook on going forward. All I want to play are VR games, and the simplest of experiences are entertaining. Do yourself a favor and pick this up. You would be doing yourself a disservice by ignoring it. It's an experience you cannot describe to anyone you have to try it for yourself. I have many years in gaming experience. Over 15 years easily. Now I've played console most of my years. Around 4 years ago I got into PC. I have played a vast amount of games. With that said I finally gave in and bought a RIFT. I have never experienced anything like this. It's a next level experience not only for gaming but adventures. My wife loves it too. Music apps to art apps, games to 3D moulding games. I got with 2 sensors and the touch. Works perfect honestly if I wasn't so picky I'd never upgrade to a 3rd sensor. But since the games I play I'd like the 3rd for easy room scale setup. It is possible to room scale with 2 lots of YouTube videos on it. But for 70 dollars nice to have the 3rd but it's not needed and it's not game breaking! Now the games wow I didn't expect so many. Lots of free cheap from a dollar to 5 dollars. Also there is a lot of AAA game titles that are great. A lot of coop players games if you have friends with the rift or just online and play with others. Not to mention you have your option of Oculus games from there webpage or steamVR. The titles are endless. That said if your thinking about it stop. Buy it or save and buy! I was skeptical but wish I would have got one sooner. Not to mention the VR movies are wild! Along with documentaries. Sit back and just be in awe or get into a game thrown right into the action. My only complaint is my face gets so sweaty! I'd like to see a moulding around the headset with a little airflow. I'll be frank the headset is good, if expensive. The problem I had was it gave me pretty bad motion sickness after tens of plating. Bestbuy wouldn't refund so have sold it on. Very disappointing! I purchased the Rift because it was on sale. was waiting for winter because the wireless headsets that aren't computer/console dependant are coming out. this went on sale for 550 and comes with free content. a lot of free content.after getting the rift because you can't beat 620 after tax for a VR experience. was worth it but you only get a total VR experience with a 3rd sensor so you can be 360 tracked. that being said its VR. if you think playing VR is like playing your normal video game its not. its a different experience altogether and really for me is hard to compare the 2 even if your playing the same game. all in all 100% worth it. you just can't beat shooting with actual guns in your hands and aiming them independently of one another. 100% satisfied. After submitting the order three times yes funds have been withdrawn from my account. I've still not seen the oculus firstly the cart is so buggy just hangs on trying to complete an order. Next after calling the order in the order was to be delivered by the next day as I paid for express. I went to the site order had been canceled. Ordered again over phone. Next day order canceled. Third time order was processed with out approval. And delivery was not next day but next week. I'd never purchase any other items from here.